No reviews on the works of a patisserie is complete without a look at their entremets, which in my humble opinion, is one of the litmus test to the skills and creativity in taste, texture and technique for a patissier. 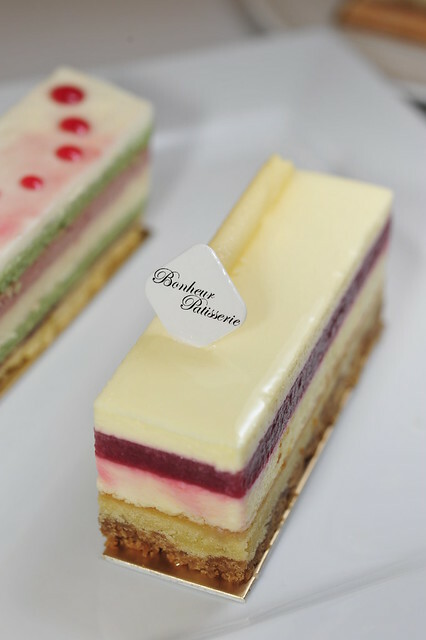 Then again, I have a whole checklist of lil’ quirky things which I look out for when I visit a new patisserie, e.g. how smooth is the creme patisserie made, how thin is the L’Opera being layered and how neatly is it being cut etc… much like how seemingly trivial tamagoyaki making skills, amidst his knife skills, is attesting to the greatness of a sushi chef. 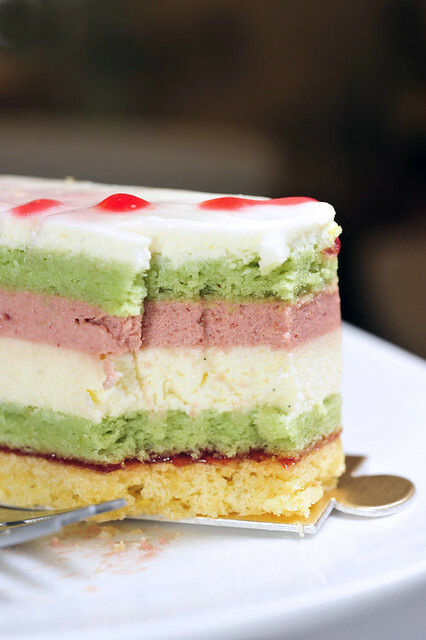 Easily one of the most popular cakes on the menu I’m sure, if not one of the most “familiar-looking” ones amongst Singaporeans. 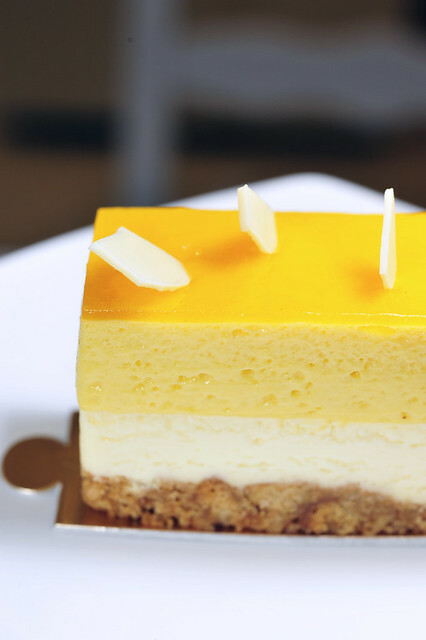 The components are fairly straight forward – digestives as a base, built up with a cheesecake layer followed by mango mousse and finally a mango-flavoured glaze, decorated with shards of white chocolate. The biscuit base had a nice crumb to it and was both savory and sweet at the same time. I like the complexity of the flavours. What was important is the biscuit base being able to hold its crunch. 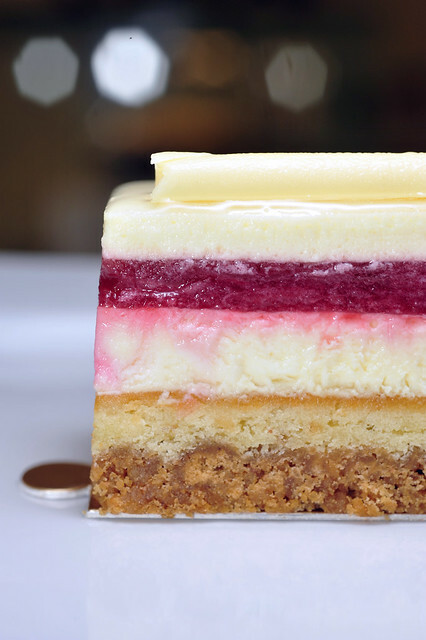 How many of you have had one cheesecakes too many with soggy bottoms?! Oh yes… I see your hands! But thankfully, Bonheur’s version had none of that. The cheesecake layer was also very smooth and yet surpringly light to the palate. That we like… so far so good! Next comes the mango mousse layer, which somehow dipped in expectations. The mango compound/paste used fell short in the aromatics of REAL mangoes and made me associate with things like mango konnyaku, mango ice-cream… in other words, flavourings. Perhaps Bonheur could look into using fresh mangoes which are abundantly available over here in tropical Singapore. Fresh fruits are definitely more challenging to manipulate, and yes, I can already think of a handful of reasons why real mangoes should be avoided. But alas, the taste and textures of the real McCoy would be so different! And I’m pretty sure the results would definitely make the effort very worthwhile. Nonetheless, it is still a rather decent cheesecake, thought I feel that its still a tad lacking in what a good piece ‘o cheesecake should have. 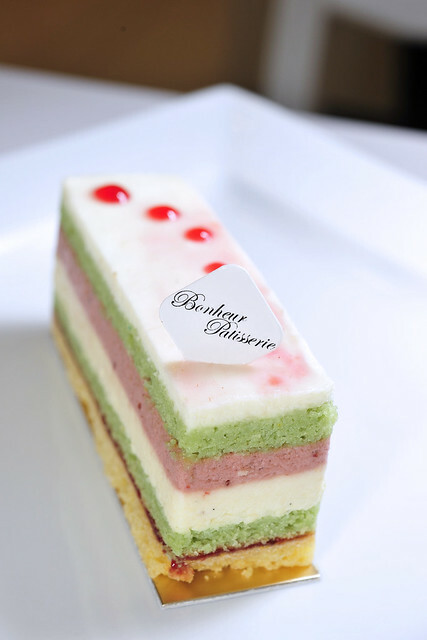 Strawberry Balsamic Mousse, a multi-layered entremet silced into individual portions of petit gateau. Working bottom up, the layers comprise of a pâte sablée base coated with a thin layer of strawberry jam, followed by pistachio sponge, vanilla bavarois, strawberry balsamic mousse, another layer of pistachio sponge and finally topped with a layer of crème Chantilly and decored with food gel and a glaze. I love the layering of this piece! The construction is very neat with the colour combinations well-thought through, grassy green amidst the rosy pink and ivory white! Another well-balanced piece with hints of sharpness amidst the sweetness. Flavours are on the subtle and light side but that was acceptable as it was probably thought out that way. I liked the smoothess of the vanilla bavarois, whose smooth and creamy texture reminds of crème brûlée but without the heft of egg yolks. 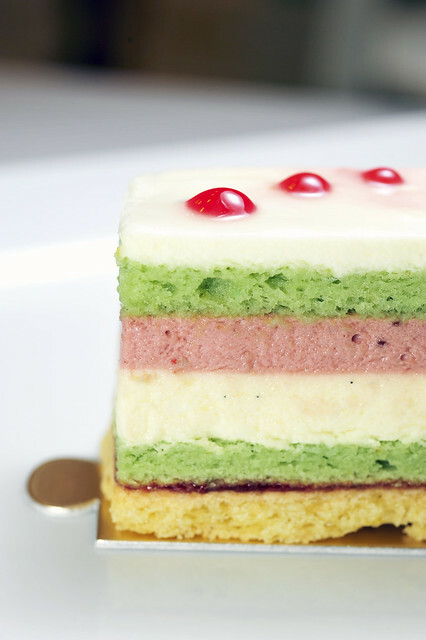 The delicate aroma of vanilla alludes quietly but surely through the layers of pistachio sponge. The latter could have been a bit more flavourful though! The sablée base provided a nice crunch with the thin layer of strawberry jam. If only the whole piece could have been a bit more tart to give it more character. If I were in dire need of a slice of cake to go with a cuppa to waste a mindless afternoon away, this would be ideal! To nitpick, the glaze and gel decor could have been neater for sure. But from what I understand, Bonheur is working on that. Isn’t it great to have patisseries who actually listen to feedback? Rhubarb Cream Mousse with a composition that is remarkably simple – layers of light cream cheese sandwiching a rhubarb compote, supported by a layer of baked almond cream over a crunch biscuit base. Delicious things can also be quaint! What hit me first was the refreshing flavours! The rhubarb compote was more astringent than what I’d imagined, and being a lover of sharp and acidic flavours, I thoroughly enjoyed it! The layers of creamcheese was also dexterously light, allowing the flavours of the rhubarb compote to come through beautifully. The baked almond cream also exuded a wonderful aroma of its own, much like crème frangipane. What got me very curious about the piece is glaze, which was supposedly neutral, but hinted of osmanthus! Odd I know! It is hardly visible when had with the other layers, but stood out quite prominently when I took a lick off the glaze out of curiosity. Most puzzling indeed. Presentation was somewhat compromised with the fluids from the rhubarb compote leaching into the lower layer of cheese cake, forming streaks of red. Butfrom what I understand, this has since been rectified with the insertion of a layer of vanilla sponge underneath the rhubarb compote to help soaked in the fluids if they were to ooze out again. Looks aside, it is very delicious and easily my favorite amongst the three. Yes the earlier two pieces have their finer moments for sure. Like I love the creamy textures of the Mango Cheesecake and likewise the vanilla bavarois on the Strawberry Balsamic Mousse. But with Rhubarb Cream Mousse has clearly more hits than misses, as apart from the oozing streaks of red, there’s really nothing much to pick on. Then again, it could be largely due to my bias and soft spot for tart-tasting pieces! This entry was posted on April 3, 2012 by Alan (travellingfoodies). 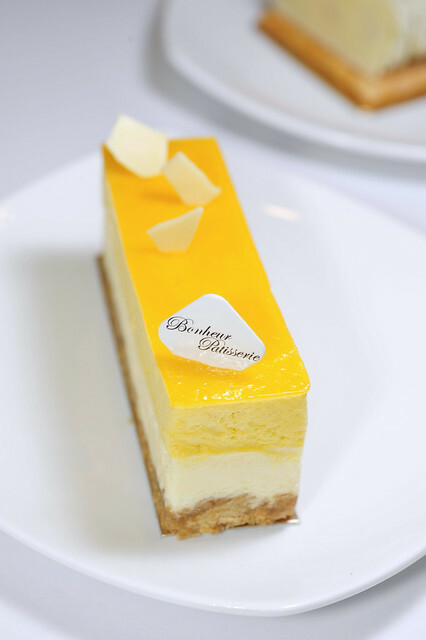 It was filed under Food, Travel and was tagged with Bonheur Pâtisserie, mango, mousse, pistachio, rhubarb, sponge. I’d take the rhubarb despite it bleeding into the cheesecake below. I love color but it’s like with the macarons- I have a hard time eating bright colors. And can I just apologize humbly if in my previous comments whien I spelled macaron with 2 o’s… Biscuits and Bobbins set me straight! Hi Wendy! I ditto on the rhubarb piece! It tasted really quite delish despite the bleeding look.